Bright colours, inspired by the non traditional vintage Christmas cards from decades ago, are used in this cross stitch pattern. Vintage Merry and Bright cross stitch pattern designed by Shannon Wasilieff. Click photo to take you to the listing to purchase. Also used in this design are some sparkly beads and Kreinik #4 braid to add some shimmer to the design. 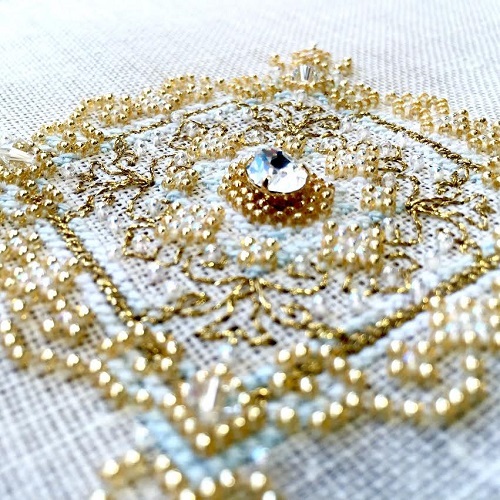 I highly recommend using an even weave linen for this cross stitch pattern as there are a good amount of quarter stitches in the Christmas baubles. Close up for Vintage Merry and Bright.